Adults: Add 1 tablespoon to your choice of beverage, stir well and drink. For fruit smoothies: Add 1 supplemental tablespoon to the blender and mix. Children: Add 1/2 tablespoon to any beverage; stir well and drink. For fruit smoothies: Add 1/2 supplemental tablespoon to the blender and mix. I'm 66 years young and a vegan for over 12 years no illness,would this product help build my 6 pack muscle on my stomach l also exercise every morning before I go to work. Yes, the Vegan Protein Powder can help increase muscle mass. A lot of people tend to see a difference in their workout as well when you incorporate natural protein into the regimen. The protein powders all help to bring your body valuable nutrients. 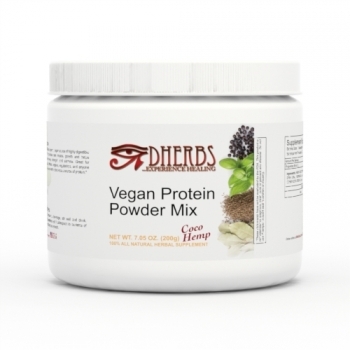 We suggest consuming any of the protein powders, except for the Coco Hemp Flavor. It contains a natural caffeine ingredient and you want to avoid caffeine while pregnant. Vegan protein powder is safe to consume during pregnancy. How much protein in a serving size? Also, the bottle came with a tiny scoop yet serving portion indicated 1 Tablespoon. Which is correct? Thanks. The powder mix has 30-35 servings. The scoop is a tablespoon.